A spacious apartment with a lovely riverside view. This was a family holiday with our teenage children. Everyone was very impressed with the beautiful apartment. From a plain door in a very plain street it is like entering another world. 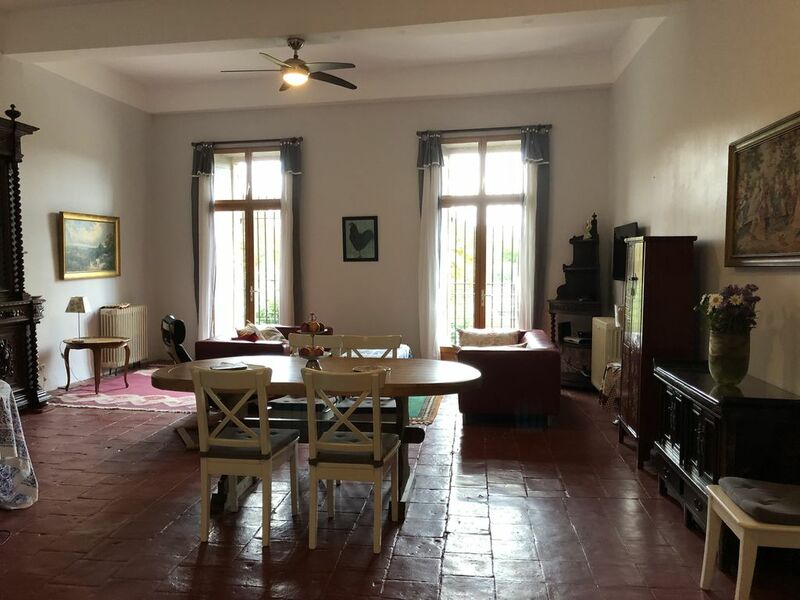 The apartment has high ceilings with very welcome fans in living room, kitchen and bedrooms. This was so useful in the 30-35c July heat. The kitchen and living room has been tastefully furnished in a very traditional French style. Bedrooms are large and have a lovely view over the garden and river. From the living room there is an airy balcony with stairs down to the garden. I have left the garden till last because it is the show piece of the property. Designed by the botanist owner this garden is a riot of colour and fragrances and has to be experienced as words are not enough. We enjoyed having our evening meal in the garden so much that no one wanted to eat out. This garden attracts bees and birds and is an absolute joy. All in all we thoroughly enjoyed our stay in this part of France and would highly recommend this apartment.